Top and side views of a homotrimer of the human PCNA sliding clamp (rainbow colored, N-terminus = blue, C-terminus = red) with double stranded DNA modeled through the central pore (magenta). A DNA clamp, also known as a sliding clamp, is a protein fold that serves as a processivity-promoting factor in DNA replication. As a critical component of the DNA polymerase III holoenzyme, the clamp protein binds DNA polymerase and prevents this enzyme from dissociating from the template DNA strand. The clamp-polymerase protein–protein interactions are stronger and more specific than the direct interactions between the polymerase and the template DNA strand; because one of the rate-limiting steps in the DNA synthesis reaction is the association of the polymerase with the DNA template, the presence of the sliding clamp dramatically increases the number of nucleotides that the polymerase can add to the growing strand per association event. The presence of the DNA clamp can increase the rate of DNA synthesis up to 1,000-fold compared with a nonprocessive polymerase. The DNA clamp fold is an α+β protein that assembles into a multimeric structure that completely encircles the DNA double helix as the polymerase adds nucleotides to the growing strand. The DNA clamp assembles on the DNA at the replication fork and "slides" along the DNA with the advancing polymerase, aided by a layer of water molecules in the central pore of the clamp between the DNA and the protein surface. Because of the toroidal shape of the assembled multimer, the clamp cannot dissociate from the template strand without also dissociating into monomers. The DNA clamp fold is found in bacteria, archaea, eukaryotes and some viruses. In bacteria, the sliding clamp is a homodimer composed of two identical beta subunits of DNA polymerase III and hence is referred to as the beta clamp. 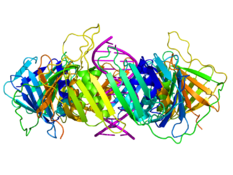 In archaea and eukaryotes, it is a trimer composed of three molecules of PCNA. The T4 bacteriophage also uses a sliding clamp, called gp45 that is a trimer similar in structure to PCNA but lacks sequence homology to either PCNA or the bacterial beta clamp. Crystallographic structure of the dimeric DNA polymerase beta subunit from E. coli. The beta clamp is a specific DNA clamp and a subunit of the DNA polymerase III holoenzyme found in bacteria. Two beta subunits are assembled around the DNA by the gamma subunit and ATP hydrolysis; this assembly is called the pre-initiation complex. After assembly around the DNA, the beta subunits' affinity for the gamma subunit is replaced by an affinity for the alpha and epsilon subunits, which together create the complete holoenzyme. DNA polymerase III is the primary enzyme complex involved in prokaryotic DNA replication. The gamma complex of DNA polymerase III, composed of γδδ'χψ subunits, catalyzes ATP to chaperone two beta subunits to bind to DNA. Once bound to DNA, the beta subunits can freely slide along double stranded DNA. The beta subunits in turn bind the αε polymerase complex. The α subunit possesses DNA polymerase activity and the ε subunit is a 3’-5’ exonuclease. The beta chain of bacterial DNA polymerase III is composed of three topologically equivalent domains (N-terminal, central, and C-terminal). Two beta chain molecules are tightly associated to form a closed ring encircling duplex DNA. Certain NSAIDs (carprofen, bromfenac, and vedaprofen) exhibit some suppression of bacterial DNA replication by inhibiting bacterial DNA clamp. The assembled human DNA clamp, a trimer of the human protein PCNA. The sliding clamp in eukaryotes is assembled from a specific subunit of DNA polymerase delta called the proliferating cell nuclear antigen (PCNA). The N-terminal and C-terminal domains of PCNA are topologically identical. Three PCNA molecules are tightly associated to form a closed ring encircling duplex DNA. The sequence of PCNA is well conserved between plants, animals and fungi, indicating a strong selective pressure for structure conservation, and suggesting that this type of DNA replication mechanism is conserved throughout eukaryotes. Homologues of PCNA have also been identified in the archaea (Euryarchaeota and Crenarchaeota) and in Paramecium bursaria Chlorella virus 1 (PBCV-1) and in nuclear polyhedrosis viruses. Crystallographic structure of the trimeric gp45 sliding clamp from bacteriophage T4. The viral gp45 sliding clamp subunit protein contains two domains. Each domain consists of two alpha helices and two beta sheets – the fold is duplicated and has internal pseudo two-fold symmetry. Three gp45 molecules are tightly associated to form a closed ring encircling duplex DNA. Sliding clamps are loaded onto their associated DNA template strands by specialized proteins known as "sliding clamp loaders", which also disassemble the clamps after replication has completed. The binding sites for these initiator proteins overlap with the binding sites for the DNA polymerase, so the clamp cannot simultaneously associate with a clamp loader and with a polymerase. Thus the clamp will not be actively disassembled while the polymerase remains bound. DNA clamps also associate with other factors involved in DNA and genome homeostasis, such as nucleosome assembly factors, Okazaki fragment ligases, and DNA repair proteins. All of these proteins also share a binding site on the DNA clamp that overlaps with the clamp loader site, ensuring that the clamp will not be removed while any enzyme is still working on the DNA. The activity of the clamp loader requires ATP hydrolysis to "close" the clamp around the DNA. ^ PDB: 1W60​; Kontopidis G, Wu SY, Zheleva DI, Taylor P, McInnes C, Lane DP, Fischer PM, Walkinshaw MD (February 2005). "Structural and biochemical studies of human proliferating cell nuclear antigen complexes provide a rationale for cyclin association and inhibitor design". Proc. Natl. Acad. Sci. U.S.A. 102 (6): 1871–6. doi:10.1073/pnas.0406540102. PMC 548533  . PMID 15681588. ^ V. Mizrahi; R. N. Henrie; J. F. Marlier; K. A. Johnson; S. J. Benkovic (1985). "Rate-limiting steps in the DNA polymerase I reaction pathway". Biochemistry. 24 (15): 4010–4018. doi:10.1021/bi00336a031. ^ a b Bruck I, O'Donnell M (2001). "The ring-type polymerase sliding clamp family". Genome Biol. 2 (1): REVIEWS3001. doi:10.1186/gb-2001-2-1-reviews3001. PMC 150441  . PMID 11178284. ^ Matsumiya S, Ishino Y, Morikawa K (January 2001). "Crystal structure of an archaeal DNA sliding clamp: Proliferating cell nuclear antigen from Pyrococcus furiosus". Protein Sci. 10 (1): 17–23. doi:10.1110/ps.36401. PMC 2249843  . PMID 11266590. ^ PDB: 1MMI​; Oakley AJ, Prosselkov P, Wijffels G, Beck JL, Wilce MC, Dixon NE (July 2003). "Flexibility revealed by the 1.85 Å crystal structure of the beta sliding-clamp subunit of Escherichia coli DNA polymerase III". Acta Crystallogr. D. 59 (Pt 7): 1192–9. doi:10.1107/S0907444903009958. PMID 12832762. ^ Lewin, Benjamin (1997). Genes VI. Oxford [Oxfordshire]: Oxford University Press. pp. 484–7. ISBN 0-19-857779-6. ^ Lehninger, Albert L (1975). Biochemistry: The Molecular Basis of Cell Structure and Function. New York: Worth Publishers. p. 894. ISBN 0-87901-047-9. ^ a b Stukenberg PT, Studwell-Vaughan PS, O'Donnell M (June 1991). "Mechanism of the sliding beta-clamp of DNA polymerase III holoenzyme". J. Biol. Chem. 266 (17): 11328–34. PMID 2040637. ^ Yin Z, Wang Y, Whittell LR, Jergic S, Liu M, Harry E, Dixon NE, Kelso MJ, Beck JL, Oakley AJ (2014). "DNA Replication Is the Target for the Antibacterial Effects of Nonsteroidal Anti-Inflammatory Drugs". Chemistry & Biology. 21: 481–487. doi:10.1016/j.chembiol.2014.02.009. PMID 24631121. ^ PDB: 1AXC​; Gulbis JM, Kelman Z, Hurwitz J, O'Donnell M, Kuriyan J (October 1996). "Structure of the C-terminal region of p21(WAF1/CIP1) complexed with human PCNA". Cell. 87 (2): 297–306. doi:10.1016/S0092-8674(00)81347-1. PMID 8861913. ^ Suzuka I, Hata S, Matsuoka M, Kosugi S, Hashimoto J (January 1991). "Highly conserved structure of proliferating cell nuclear antigen (DNA polymerase delta auxiliary protein) gene in plants". Eur. J. Biochem. 195 (2): 571–5. doi:10.1111/j.1432-1033.1991.tb15739.x. PMID 1671766. ^ Marshall, Andrew C.; Kroker, Alice J.; Murray, Lauren A.M.; Gronthos, Kahlia; Rajapaksha, Harinda; Wegener, Kate L.; Bruning, John B. (Feb 2017). "Structure of the sliding clamp from the fungal pathogen Aspergillus fumigatus (AfumPCNA) and interactions with Human p21". FEBS J. 284: 985–1002. doi:10.1111/febs.14035. PMID 28165677. ^ PDB: 1CZD​; Moarefi I, Jeruzalmi D, Turner J, O'Donnell M, Kuriyan J (March 2000). "Crystal structure of the DNA polymerase processivity factor of T4 bacteriophage". J. Mol. Biol. 296 (5): 1215–23. doi:10.1006/jmbi.1999.3511. PMID 10698628. ^ Steitz TA, Shamoo Y (1999). "Building a replisome from interacting pieces: sliding clamp complexed to a peptide from DNA polymerase and a polymerase editing complex". Cell. 99 (2): 155–166. doi:10.1016/S0092-8674(00)81647-5. PMID 10535734. Watson JD, Baker TA, Bell SP, Gann A, Levine M, Losick R (2004). Molecular Biology of the Gene. San Francisco: Pearson/Benjamin Cummings. ISBN 0-8053-4635-X. A dimer of the beta subunit of DNA polymerase beta forms a ring which encircles duplex DNA. Each monomer contains three domains of identical topology and DNA clamp fold. DNA polymerase III is a complex, multichain holoenzyme responsible for most of the replicative synthesis in bacteria [PUBMED:8548826]. It functions by adding nucleotide triphosphate (dNTP) residues to the 5'-end of a growing DNA chain, using a complementary DNA as template. The elongation factor beta-clamp, also called beta subunit, is part of the DNA polymerase III holoenzyme. However, beta-clamp is not attached to polymerase III permanently like the other subunits. It is loaded on the DNA, by clamp loader, a subunit of DNA Pol III [PUBMED:27499105]. The beta clamp forms a ring shaped dimer that encircles dsDNA (sliding clamp) in bacteria. 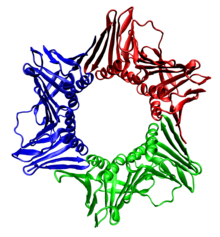 The bacterial beta clamp is a homodimer; each monomer consists of three globular domains to yield a six-domain ring [PUBMED:18191219]. It is structurally similar to the trimeric ring formed by proliferating cell nuclear antigen (PCNA) (found in eukaryotes and archaea) and the processivity factor (found in bacteriophages T4 and RB69) [PUBMED:1358275]. This structural correspondence further substantiates the mechanistic connection between eukaryotic and prokaryotic DNA replication that has been suggested on biochemical grounds. This entry describes the C-terminal domain of the beta sliding clamp. Sliding DNA clamps are ring-shaped proteins that allow DNA polymerase to achieve high processivity during chromosome replication by tethering the polymerase catalytic subunit to DNA. All of the structures share a 12-fold symmetry around the ring consisting of a simple structural repeat, though there is structural divergence in some of the repeats. Bacterial beta-clamps contain six repeats per subunit with two subunits per ring while the eukaryotic and bacteriophage clamps contain four repeats per subunit with three subunits per ring. Pairs of these repeats form a domain, which has been termed the 'processivity fold'; thus the ring of the sliding clamp contains six domains and therefore is often described as having 6-fold symmetry. A structural representative of a fourth family of processivity fold proteins, namely the herpes simplex virus UL42 protein, is also available. UL42 does not form a ring-shaped clamp, however, but rather functions as a monomer and interacts with DNA quite differently than do sliding clamps; it has been suggested that UL42 resembles a primitive ancestor of sliding clamps . For those sequences which have a structure in the Protein DataBank, we use the mapping between UniProt, PDB and Pfam coordinate systems from the PDBe group, to allow us to map Pfam domains onto UniProt sequences and three-dimensional protein structures. The table below shows the structures on which the DNA_pol3_beta_3 domain has been found. There are 183 instances of this domain found in the PDB. Note that there may be multiple copies of the domain in a single PDB structure, since many structures contain multiple copies of the same protein sequence.